One of my yoga students gave me a recipe. The title sounded good and as I started reading the ingredients I was thinking it sounded good until I got to the cream of mushroom soup. It just sounded really odd to me to add cream of mushroom soup with the other ingredients. I told her that, but she assured me that it was really good. She said that the dish is a hit whenever she takes it somewhere. She said everyone likes it when she makes it. So, I trusted her. And decided to try it. I am always looking for new recipes to try that are easy. This one looked really easy. It doesn’t have that many ingredients and it had the potential to turn into a staple. So I tried her recipe to Taco Pie. Since I so often use my blog as my recipe book I am documenting this recipe with some of the changes I made and how I will make it in the future. 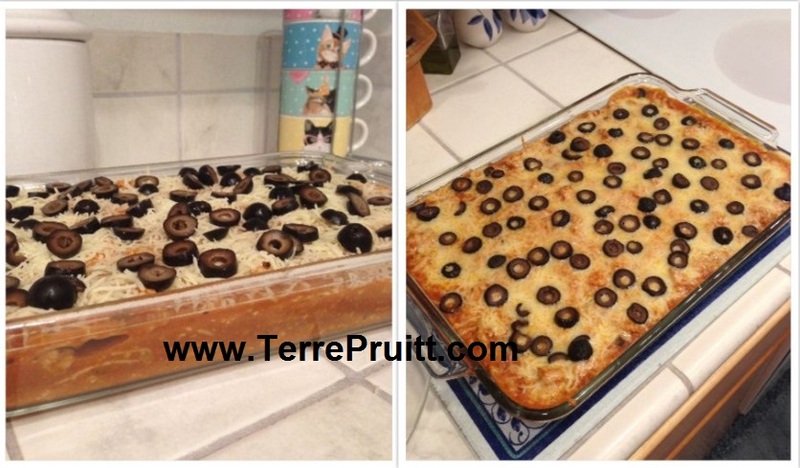 I will explain below the changes I have (or will make) and why below the recipe. Heat the oil in a large pan. Chop the onion, then add the onion to the pan. Cook until translucent. Add the meat (crumbling it as you cook it or crumble it into the pan). Salt the meat as you cook it. Sprinkle the meat with garlic powder and some cumin. Not a lot (that is why I didn’t even put a measurement), you are just adding a tad bit of flavoring to help layer the flavors, but you still want the sauce mixture to be the star. Cook the meat until it is about half done. 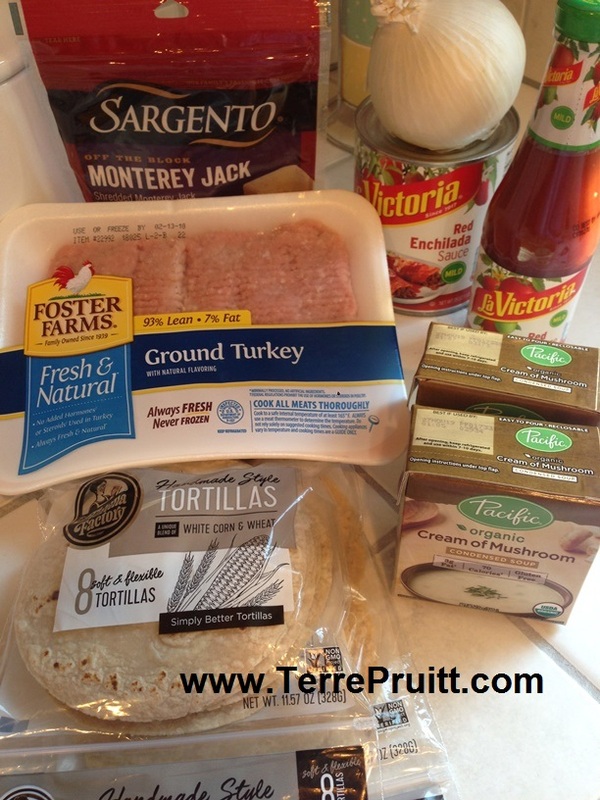 Add the enchilada sauce, the taco sauces, and the cream of mushroom soup. Stir until it is all mixed together with the meat. Bring to a boil. Then let simmer over medium heat for about 10 to 15 minutes. Let the sauce flavor the meat. In a 9X13 baking dish you are going to do layers. First layer is 1/3 of the sauce, then a layer of sprinkled of cheese, the next layer is 6 tortillas to cover the sauce. Then 1/3 of the sauce, a layer of sprinkled of cheese, then six tortillas. 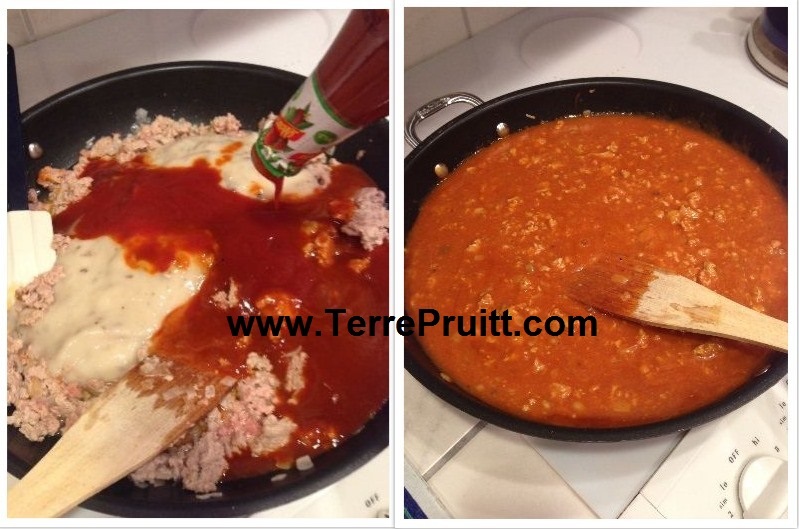 Then use the rest of the sauce to cover the tortillas, then cover it with the cheese. I have written before about how I don’t really care for the taste of plain meat. Plain meat to me, is just really not appetizing. So, when I made this recipe I cooked the turkey with chopped onions, as I stated in the recipe. It still was not enough for me. I like layered (or what I call layered) flavors. And to me, the plain meat just tasted plain. It stood out from the sauce. I like everything to meld together. So, the next time I make this I am going to add the spices as I have stated in the recipe. The original recipe called for two cans of cream of mushroom soup, I used two boxes. That is a difference of four ounces. 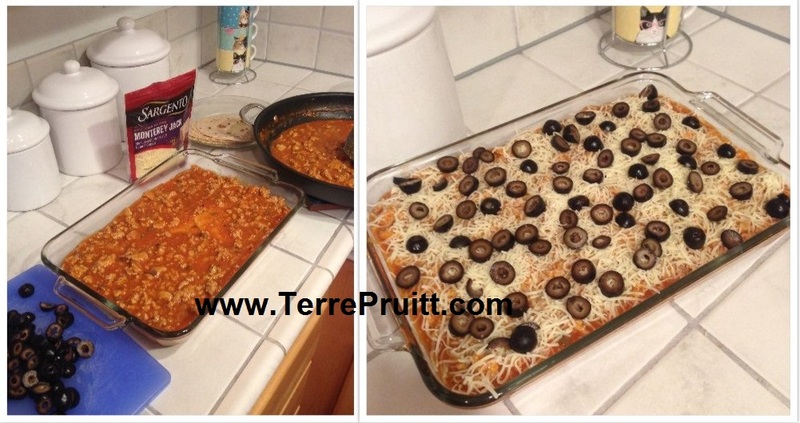 I did reduce the amount of enchilada sauce by two ounces, but it was still very soupy. All of the meat and sauce leaked out from between the layers and I was just left with stacked tortillas and the sauce on the side. So, next time I am going to reduce the liquids as stated here in the recipe. Not that much, but perhaps with the increased cooking time on the stove top this will help reduce the amount of liquid. This was really good. As I type it up I am wanting to make it again. 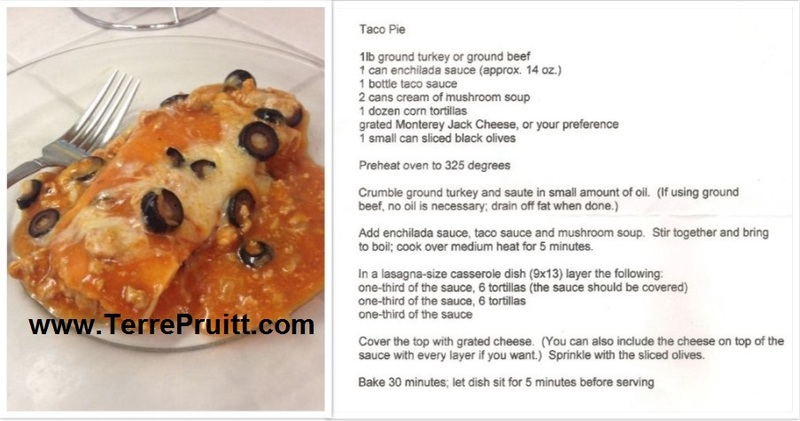 Thanks, Judy for this recipe! And as with any recipe it is fun to add and subtract and make it your own. I thought of adding mushrooms – because I love mushrooms – and/or chilies, but I really love the simplicity of this recipe so I doubt I will be adding much to complicate it, but that doesn’t mean you don’t want to fancy it up. How does this sound to you? 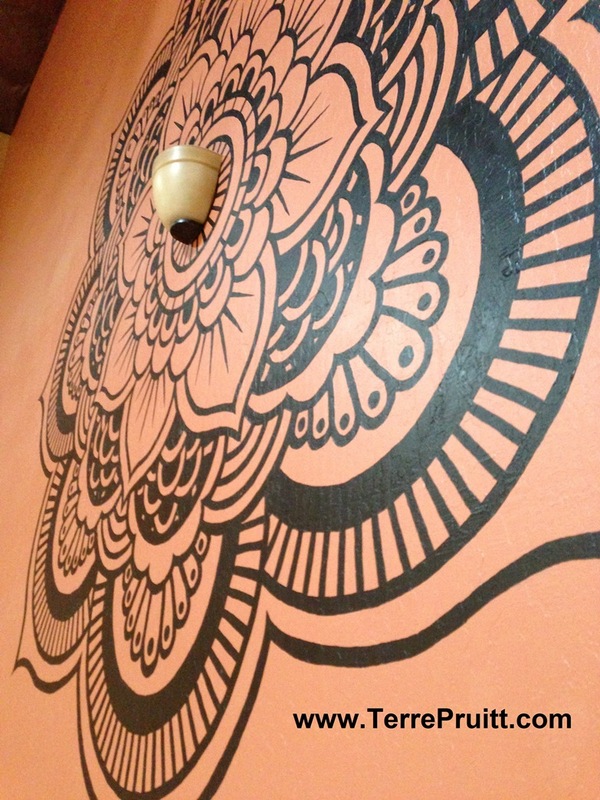 What will you add to it to make it your own? In my last post I mentioned family, friends, and both Nia and yoga students giving me cat things or things related to yoga this past Christmas. I received a lot of cute things. And I received a lot of thoughtful gifts. I want to share another one. (I know I have already posted about a few.) One of my students gave me a Gumby. Do you member Gumby? He is very flexible and bendy. She said it was because she called me Gumby, although I don’t ever remember hearing her call me that. 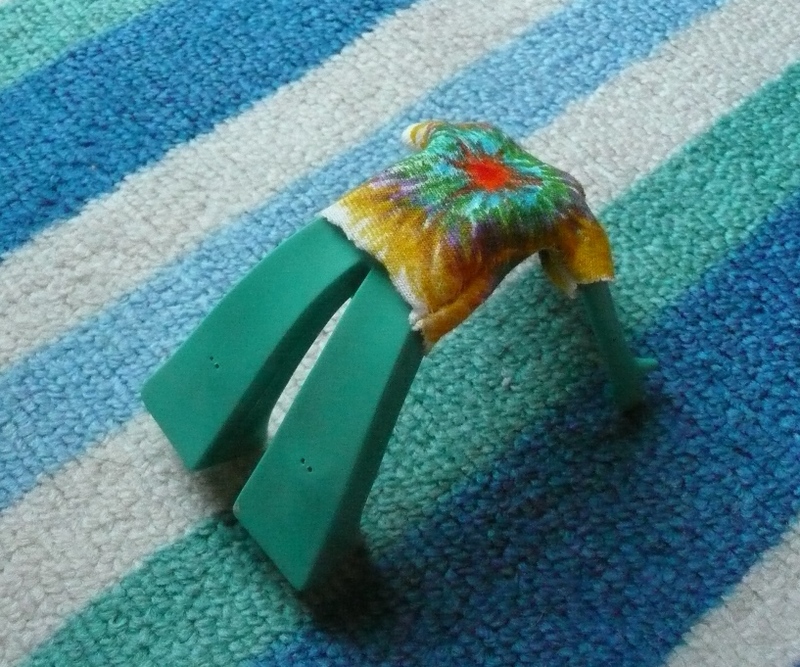 He has a tie-dyed shirt on! So cute! She made a tie-dyed shirt for him. She actually “tie-dyed” it. At first I thought she just found some material that looked tie-dyed and then she used it to sew a shirt. But nooooo! She actually used pens and colored the shirt making it tie-dyed. For those of you who have never taken one of the classes you might not realize that I wear tie-dyed shirts. They are kind of like my “uniform”. So this was super cute. It made me laugh. We were going to lunch the day she gave it to me and I had to bring it into the restaurant to show everyone. I also wanted to share it with you because it was so cute. I also have some Gumby facts because this particular Gumby is a 50th anniversary edition Gumby so the packaging came with interesting facts listed about Gumby. I can say that I really didn’t know that much about Gumby. So these were things I didn’t know about Gumby. -Gumby’s TV debut was on the Howdy Doody Show in 1956. -Gumby got his own show that year. The Gumby Show. -The Gumby Show aired from 1956 to 1968. -By 1966, Gumby sales break all records. -It takes 1,440 still-frame pictures to make 1 minute of clay animation. -In 1988 100 new Gumby episodes were produced. -There are 214 Gumby episodes in existence. -Gumby’s first feature film was release in 1995. So there. Now you know some Gumby facts. 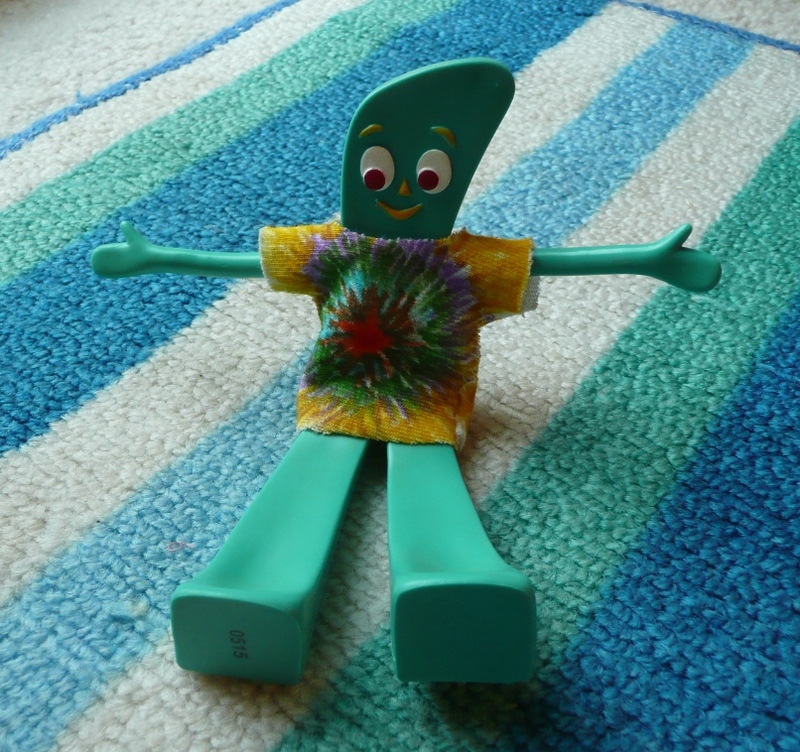 Do you remember Gumby? Did you watch him on TV? Do you remember his side kick? Ha! 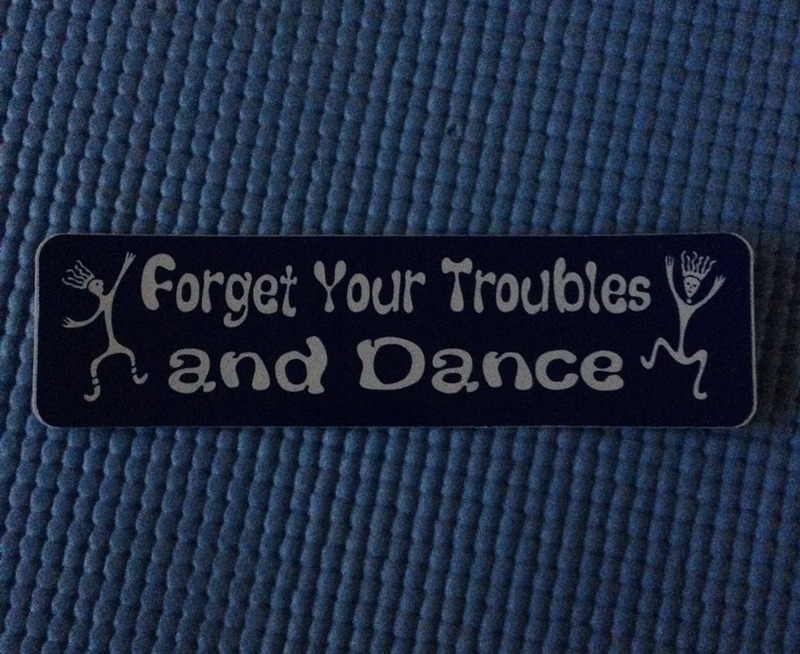 One of my yoga students gave me this for Christmas! Cute, huh? 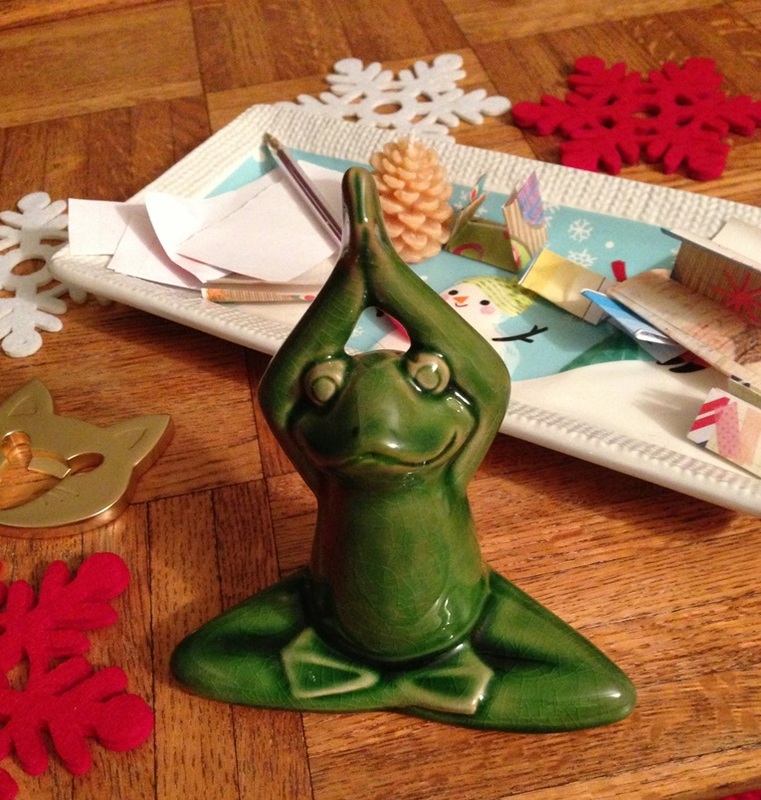 A little frog in the lotus pose. I love it. What about you? I thought it was a good Friday Photo share. What do you think of this green guy? I’ve been thinking lately about when a student once asked me what exercises to do so that s/he would be able to do yoga. My reply was to just do the poses. I explained that doing the pose in the way that s/he could at that moment is the way to “do yoga”. I got the feeling that this answer was not satisfactory, because the look on her/his face. Then the following week after class, the student had a little booklet. This person said that her/his spouse was given the booklet by their doctor and was told to do the exercises. The question being asked was what exercise could the student do that would enable her/him to do yoga. I softly sighed and took the booklet and flipped through the pages. I pointed to the exercise that were pretty much like some of the poses we had just done. I suggested s/he try them. I’ve been thinking about this because of two things: One, yoga is not about DOING a specific pose. This is very difficult for people to accept. And, two, I think I will start suggesting one pose that will help with all poses when asked this type of question. I’ve been thinking about how yoga is not about “doing a pose”. Doing yoga is so much more. And I am specifically just talking about the asana here. In regards to do the asana the way to do them is by doing them. As we do them, they might get to be more than what it was when we started. An asana is not like running a marathon. One needs to plan and prepare for a marathon. One needs to train to run a marathon. One needs to build up to being able to run 26 miles. But even the training for a marathon consists of running. It consists of DOING the thing it is you are going to be doing. Warming up the body with easier poses or very highly modified poses before doing the most challenging pose is recommended. But doing other exercises so that you can do yoga is not necessarily the point of the postures. Part of the beauty of yoga is that you do what you can when you can and you continue to do it until you can do more. Then you continue to do what you can do, until you can do more. You keep practicing until you think you have it perfect, then you do more. “More” could be matching the perfect pranayama to the pose. It could be concentrating so well that you can sense “every” muscle required to do that pose. It could be making your mind quite. It could be moving ever so slightly while in the “perfection” of that pose to see what it is like when you move a little more forward/back/up/down. There is always “more” to a pose. I was really trying to convey this to the student, but that was not the answer s/he wanted to hear. S/he wanted to know what to do so that s/he could get into the poses and do the poses. I know there are things in my life I am impatient for and I just want the end result without having to do/wait for it. But with yoga there really is no end. It is like life it is the journey. But regardless, when I get this question again, I might just reply with the most challenging of all poses . . . . corpse pose or shavasana. I might just suggest that the student try practicing shavasana for three to five minutes. I think that might actually help. Once the practice of being still (in the body) and being quiet (in the mind) is achieved or at least better understood, then maybe the answer about doing yoga to do yoga will be understood. I’ve heard many people say there aren’t flexible enough to do yoga, well, you do yoga to GET flexible. So, what do you think about doing something in order to do it?